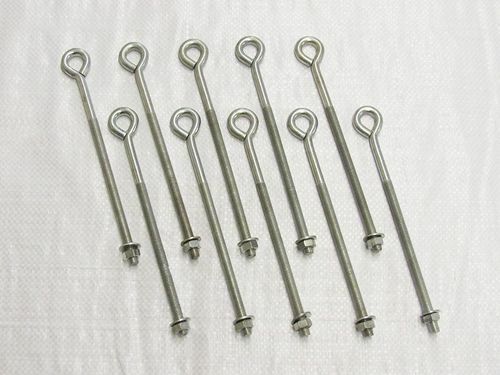 We have a variety of folded straining eyebolts here at SecureFix Direct, which are made from the highest quality materials, to be used to strain wire in fencing. Our eyebolts come in three different sizes, from 6mm to 10mm so suit all of your needs and requirements. Here at SecureFix Direct, we understand the need for longevity and durability, so all of our folded straining eyebolts are zinc plated for extra protection against a variety of weather conditions. We offer all of our folded straining eyebolts in a range of lengths too, ranging from 100mm to 300m – depending on the size of the eyebolt. All of our eyebolts come complete with a nut and washer and are available in multipacks of ten so you can be sure to get the best value for your money. Why Choose SecureFix Direct For Your Folded Straining Eyebolts? Here at SecureFix Direct, we offer a vast selection of garden fencing and landscaping supplies which balance high quality products with affordable prices. We are determined to provide the best customer service and with our long standing experience, we know exactly what you need to get the job done. We offer a free delivery and fast dispatch service too, so you can get your products as quickly as possible. If you have any questions regarding our products, don’t hesitate to get in touch with a member of our friendly team today.